An uppdate. I have not done much on the boat lately. It gives me a bad conscience but I have to live with that. What has happened is the dentist has pulled out 7 teeth. Preventive. Now there is only the front ones, the elegant ones left. It took the dentist one and a half houer to get them out. They were well anchored. I think tooth ache might be one of the big problems on a trip like the one I am planning. With only the front one left the problem is much reduced. When I came home from teh dentist I went to sleep. After two hours I woke up I had pain and could not sleep. There are painkillers but my philosophy is aginst them so I do not use them. I think if you go for the soft way no good will become of you. This pain have now being going on for about three weeks. Now I feel fine and the wounds in my mouth is mostly heeled. However my daily rytm have been changed a bit like jet leg. I am now awake in the night and sleep in the day. Soon I fix that to. To amuse me I have been writing. It is a thing that has to be done to get me money. Progress is good. I have been to Stockholm to give a talk. There I went to my editor at Norstedts to discuss the book. Also in Stockholm I met my new adept a boy of 19 year that like to sail the deep waters. 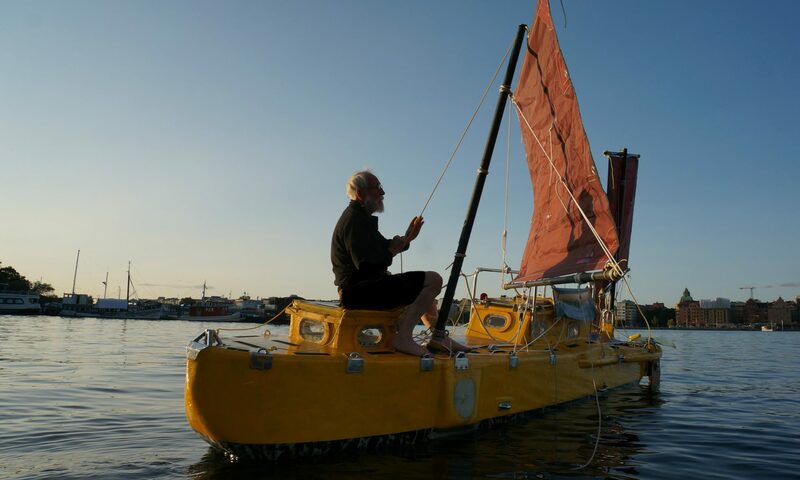 He met a kayak instructor living i Camarones Patagonia Argentina when kayaking with his father in Greenland. He has decided to sail to Camarones. He has bought an Hurley 22 fot that purpose. I will help him to modify it for the voyage making it better adapted to the kind of sailing he intends to do. 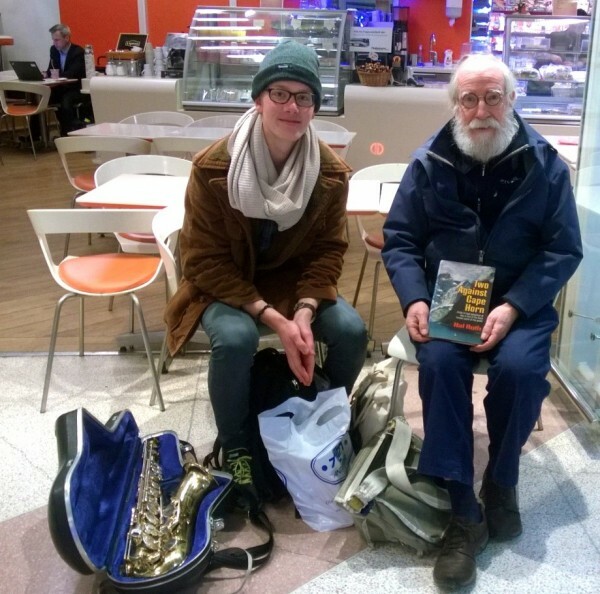 The obove photo shows Yrvind and Huledal at the Stockholm bus terminal. I am giving him some books to study. I belive in information and being educated about what you intend to do. the book I am showing is Two against Cape Horn by Hal Roth. There are five more in the plastic bag.